Margie has always wanted to see the cave paintings that are quite prolific in the Pyrenees of Southern France and Spain. 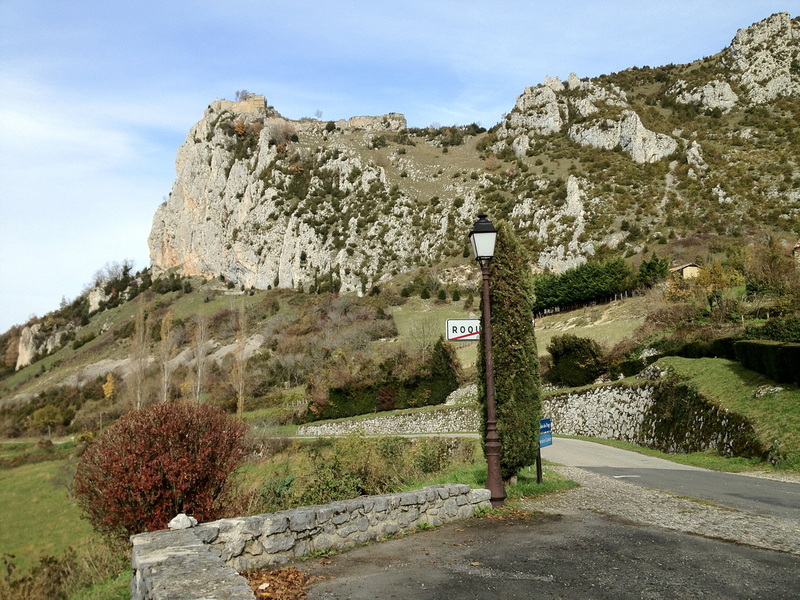 By co-incidence there is a site near the last of the Cathar Castles at Monsegur. 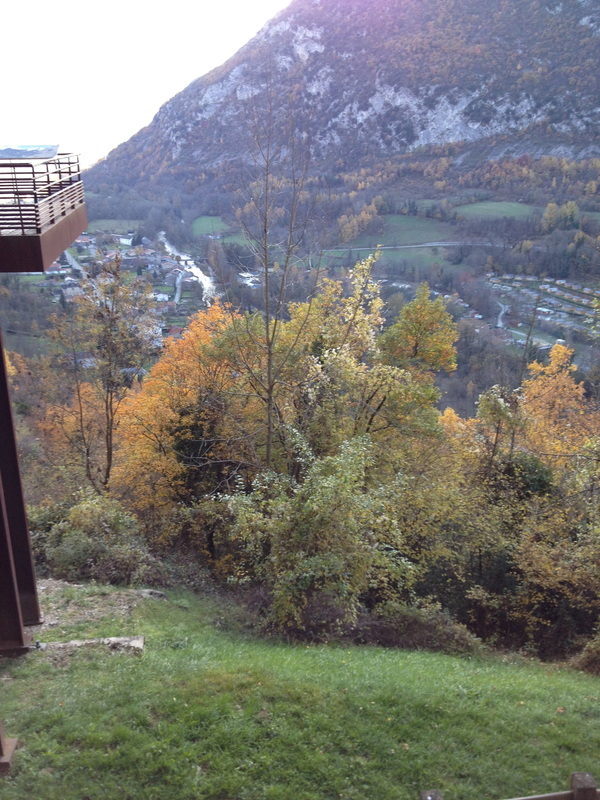 We decide to take an over night trip and see both of these sites plus get a view of the Pyrenees Region. 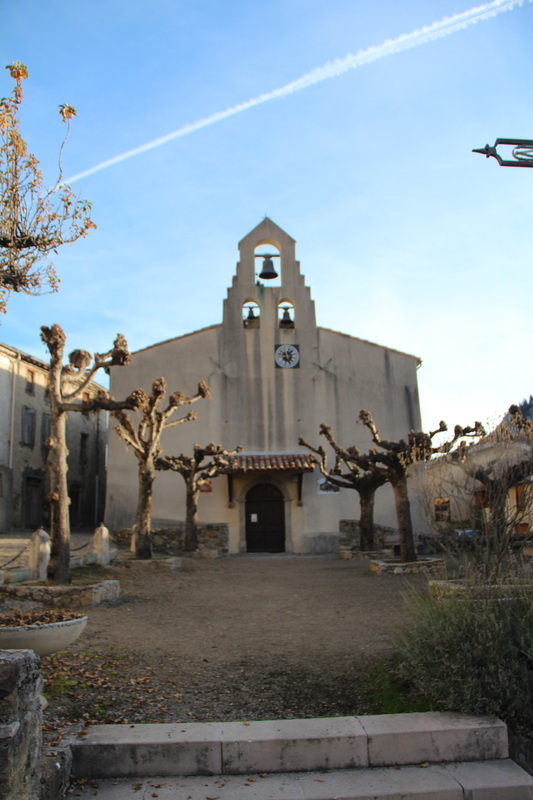 We get a later start than we wanted but it is not all that far and by lunch time we are near the Village of Tarascon and Le Parc de Prehistoric. It is lunchtime and the ticket office is closed (of course). Sooner or later we will adapt and not arrive anywhere between the hours of 12-2pm where everything outside of metropolitan France shuts. We have bought some lunch and it is a lovely sunny day so we have our baguette salad rolls while we wait for 2 pm. At 2 we go to the ticket office and can see no sign of life. Eventually mademoiselle appears to announce that the park is shut to all except l’ecole (school groups). She is however able to book us a tour of the nearby Niax Grotto but not until 4pm. As we have a couple of hours to fill in we decide to drive over to Montsegur (about 25 kms) and book into our accommodation. As we approach Montsegur the remains of the fortress on the towering rock become visible. It is a dominating and impressive sight. 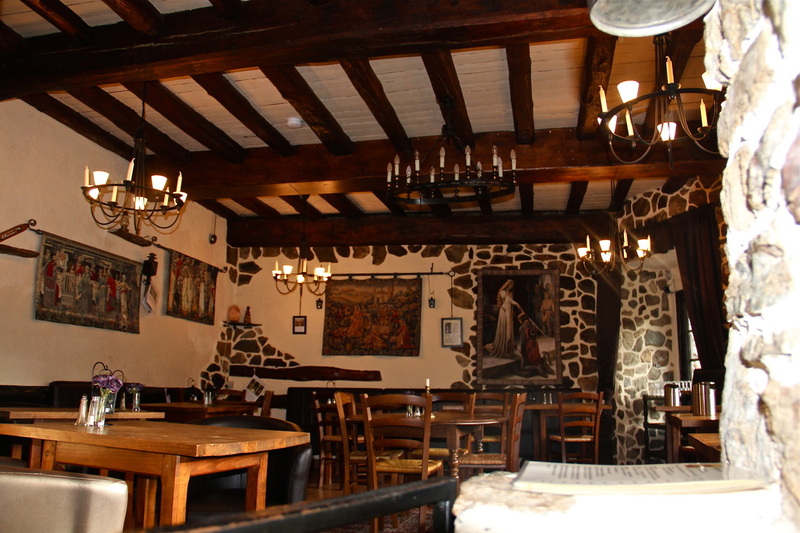 We find the Auberage de Montsegur and with little language difficulty book in and make a reservation for “le diner”. 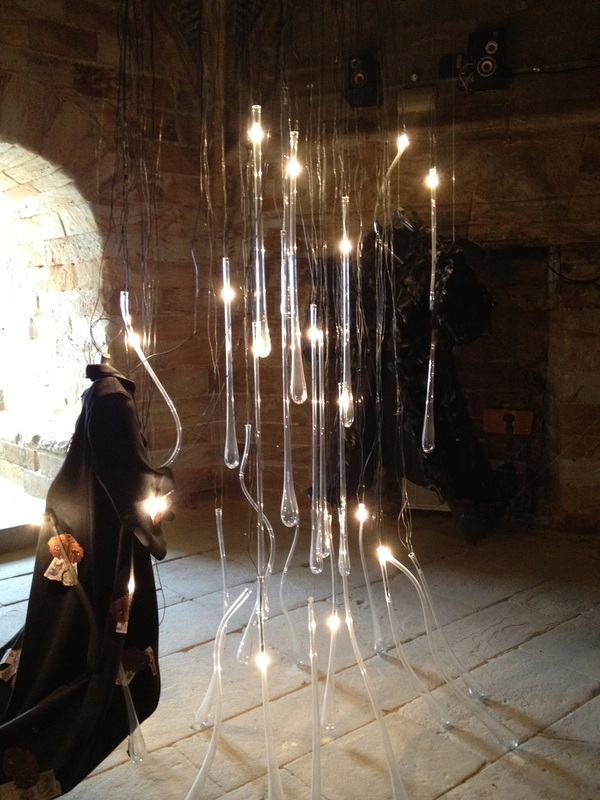 Then it is back to Niax and the grotto. We check out the permanent exhibit and then with the French guide (who promises “some English”) plunge into the depths of the cave. The cave and the 15,000 year old drawings are a story in themselves (see travelswithmyarteacher.wordpress.com) but it is truly mind bending to try and understand how and why primitive man, hardly having learned to communicate or build permanent shelters would produce such fine drawings. The cost in personal effort must have been tremendous. To haul wood a kilometre underground and then make such drawings in the light provided by a fire or an animal fat lamp is an amazing effort but why. Perhaps it is the same question as why did we want to send a man ( or men) to the moon. Back at the Hotel we freshen up and then down for dinner. The quaint little restaurant in about half full and there looks to be a mixture of locals and French tourists. The lady running the house however is obviously English and so language is no problem tonight. The cooking is French Regional and so we enter into the spirit. · Entrée a spicy pumpkin soup for Margie and smoked salmon for me. The smoked salmon is good but not as good as the Irish which must have the best smoked salmon and mussels we have encountered. · My main is white boar in red wine stew. A rich game stew in red wine sauce that is very good. The starch is added by tagliatelle which is a bit dry and stiff. A pity but it does not really distract from the rich and satisfying stew. · Margie has a Cassoulet. She is yet t be convinced that this is a great dish and decides to try it herself to see if she can make a better version. After this neither of us can fit in any dessert that always seems to be a great disappointment to the French. We go for a walk around the very quite village in the very cool evening. The sky however is a blaze of stars which promises a fine day for our assault on Montsegur tomorrow. The morning dawns fine and although there are some wispy clouds there doesn’t seem to be any chance of rain. 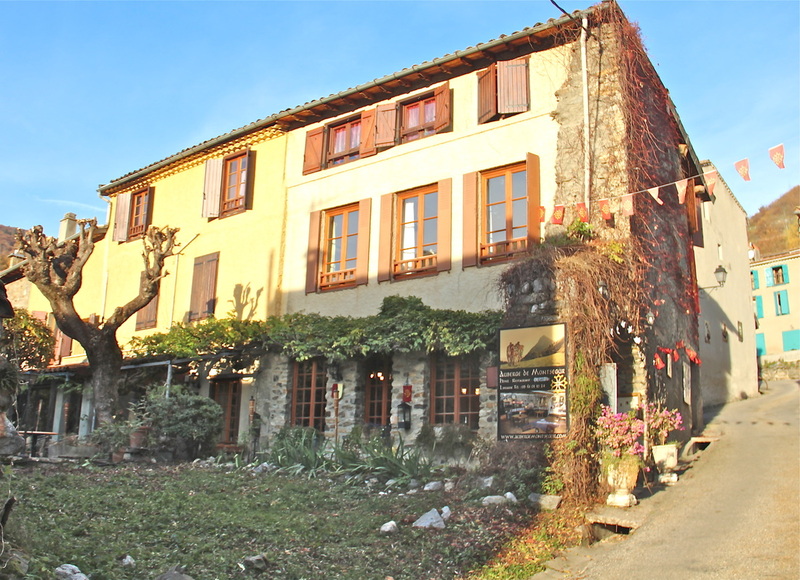 We have the French “Continental” breakfast and then it is off for the very short drive to the foot of Montsegur. It is more intimidating up close so we decide to get stuck in before we chicken out. There is a E4.5 charge for going up but, in typical French fashion, the ticket booth does not open until 11am. No-one else seems concerned and they are just proceeding up the hill regardless. We head on. It’s a steep and rocky climb and there is little (in fact no) evidence of ropes, balustrades or other safety devises. Finally we struggle up the last 50 m of rough path and climb onto the wooden platform at the entrance to the remnants of the Chateaux Montsegur. Wow what a view. It is said that on a very clear day you can see Toulouse (100k s away) from here. What we see here now was mostly constructed well after the end of the Cathar period. 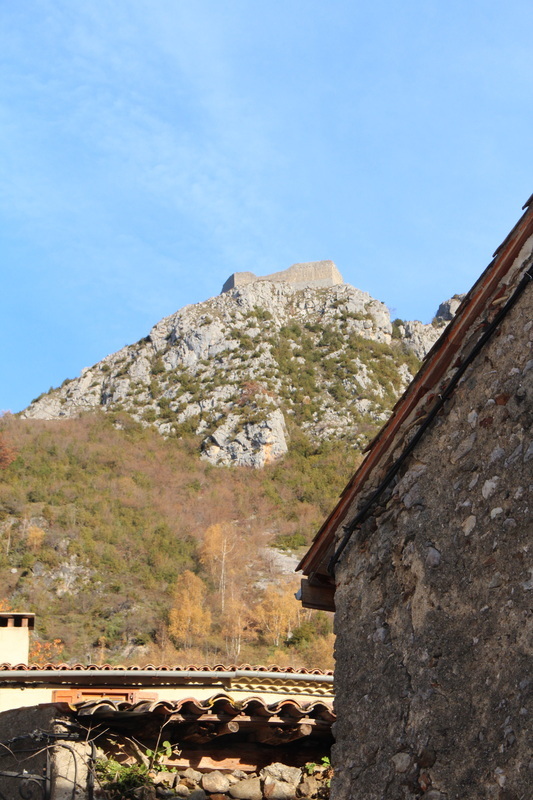 There are however some remnants of the Cathar Fortress and the mountain itself is a natural fortress. This was the last refuge of the Cathars who gathered here after Beziers and Carcassonne fell in 1209. Although Simon de Montfort had meet his end before Montegur fell other mercenaries (called crusaders by the Catholic Church) carried on the work. In 1243 6000 crusaders laid siege to Montsegur. 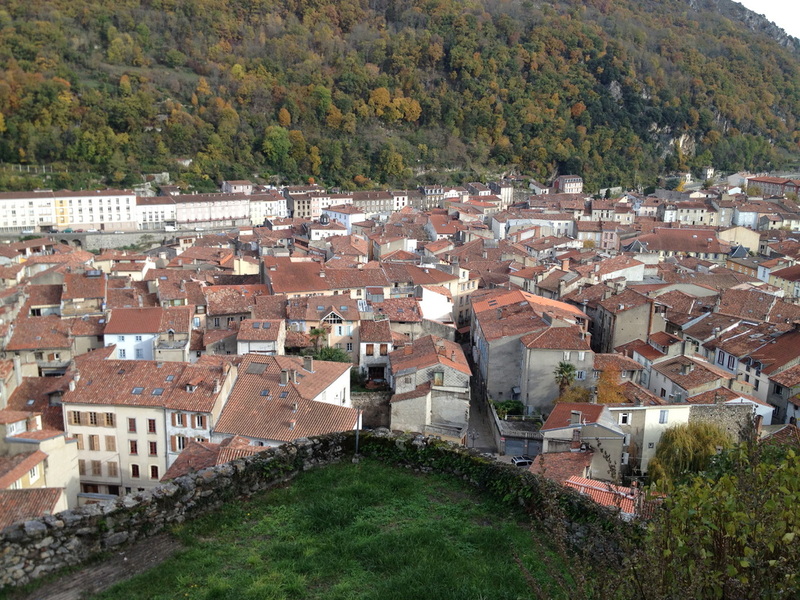 There were 400 Cathars in the Fortress. They held out for almost 2 years but when they were finally starved out and those that refused to recant their beliefs, about 160 people, were burned at the stake at the foot of the mountain. I wonder why you would not recant to save yourself. Maybe the answer lies in the following reasoning. If the Cathars doctrine is correct then death is just a transition to another (hopefully better) state. If the Church is correct and you recant and are saved you would have to spend the rest of eternity hanging out with the bloodthirsty monsters who have run this crusade for 35 years. Perhaps this was an unpalatable thought and the flames looked a better option. It is hard to spend too much time pondering how mankind can be so cruel to his fellow creatures on such a beautiful day in such a breathtaking place. We make our way back to the car and set the GPS to take us on the scenic route to Fiox, the capital of this region. 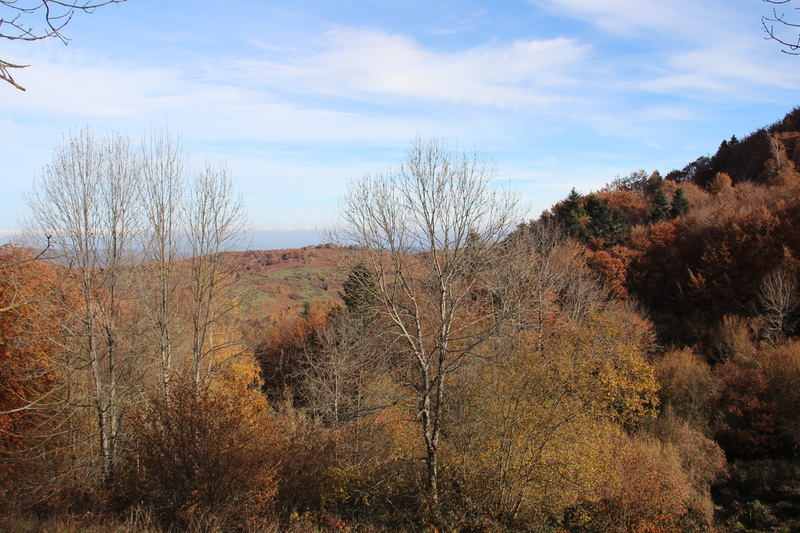 The path takes up a mountain road initially through a beech forest that is ablaze with autumn colours and then into the higher meadows where the large grey long horned local cattle are grazing. We look down on the forests, farms and villages below and the view is breathtaking. Soon we come to the little village of Roquefixade sheltering under another impressive massive cliff topped with yet another Chateau. We have some food left so we stop in a small park on the edge of the village and have some morning tea. We are joined by a local cat, who true to its French nature, loves baguette. Then there is a short drive to Fiox. We arrive at about 12.30 and of course the castle is closed for lunch. We ramble around the streets and come across a 2nd hand shop. Inside there is a stack of old newspapers, or perhaps more correctly journals, called “L’Illustration Journal Universal”. They are a weekly journal and there are many here covering almost all the period of WWI. We buy 2 E10 each. A great piece of real history now we just have to learn to read French. We also find a little restaurant that is doing quiche and the like that looks like a good option for lunch. Two quiche Lorraine and a cup of tea (yes well I gave up the “real man” tag a few years ago). Anyway Susan Vega is playing and I try and use it to strike up conversation with the waitress. No go, “je ne comprehende”. However she does tell the owner that “English” are in the house and he comes out to chat. He is English and has been there for 16 years. He is able to give us some further valuable insights into French attitudes and culture. We make our way back to the castle that is now open and give it the once over. Again the history (been there for over 1000 years in one form or another) is fascinating. In addition the French use every opportunity to establish some form of exhibition or installation (of an artistic type) wherever they can and there are several here. Perhaps the most interesting thing is a 500-year-old book explaining the local rulers love of hunting. The book is illustrated magnificently and is of course on display in a locked cabinet. However there is projected onto a book shaped piece of white marble a copy of the open pages as if the book is lying open. When you brush your hand across the image on the marble the page turns, not just replaced but the image looks just like a turning page. Amazing and so high tech I can see it capturing a whole generation of young techno geeks. Well after climbing up Montsegur and then two castle towers we are a bit worn out so we recover the Citroen and ask Juliet to set a course for Olonzac.